We are excited to announce that Rav Haim Amsalem shlit’a, noted speaker and writer has agreed to present the shiur on April 17th. The shiur will take place in Bet Knesset Ohel Yonah Menachem in Bet Shemesh. The topic will be “Approaching the Haggadah Via the Prism of Halacha”. The shiur will be in hebrew. Marei Mekomot will be provided. The schedule: 8:00pm preparation for shiur. 8:30pm Maariv followed by shiur at 8:45pm and a Kibbud at 9:45pm. Rabbi Haim Amsalem is scholar, writer and speaker. He is the author of several sefarim including Zera Israel. 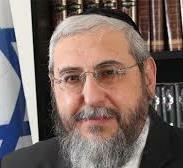 He is a former member of the rabbinical council of Shas and served as an MK from 2006 to 2010 with Shas and from 2012 to 2013 with Am Shalem.